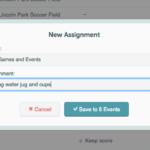 If you haven’t tried our new Assignments tab yet, you’re missing out! It’s the easiest way to track who’s bringing what to each and every game. Head over to the Assignments tab and choose an upcoming game. Assign the role to a player. If you’d like to alter your lineup, simply click and hold the icon to the left of the player’s role and drag up or down. This will help you reorder your lineup with ease. When you’re ready, click “Save” and you’re set! Just follow the prompts on the next screen. Once completed, you’ll send an email to your whole team with a clean copy of the lineup. Pretty cool, huh? And one more thing: You can even set and view your lineups from your mobile app by tapping on the game and scrolling down to the Assignments section at the bottom of the game detail screen. Does this look like something you’d be interested in? Assignments are available with any of our paid plans, so upgrade today and set your lineup in minutes!